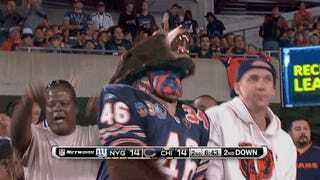 Bears 27, Giants 21: A game on short rest was the least helpful thing to the Giants' 0-5 woes. New York actually held it together for the most part, though, and their defense gave the team a chance. Unfortunately, Eli Manning's turnovers severely hindered the offense. 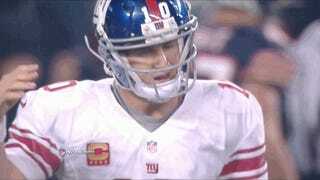 Matt Schaub knows how you're feeling right now, Eli. It started out inauspiciously when Manning threw a pick on his second pass of the game. Manningface had bloomed early this Thursday night. But the Bears turned the ball over on downs at the Giants' four-yard line, because they were apparently allergic to field goals? Regardless of the reasoning, Chicago's turnover meant that Manning's first pick had no effect. Still in this, guys! But Eli was far from done. The night was young. His fifth pass didn't find an oblivious Rueben Randle, but Tim Jennings, who took Manning's second pick to the house. 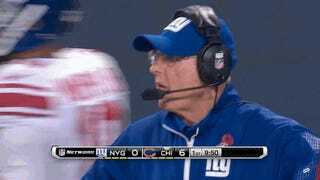 Tom Coughlin was so angry, he just ceased to be mad. His brain could not handle all the rage. Everything broke as he mechanically chewed his gum. To be fair, it was only 7-0 after this, and the rest of the game wasn't indicative of New York's start. 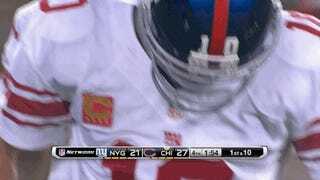 The Giants tied the score after a Brandon Jacobs touchdown run. 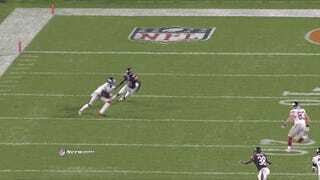 In the second quarter, the Bears took a 14-7 on Jay Cutler's pass to Brandon Marshall, but Rueben Randle's TD knotted the score again. There was this guy dressed in a bear outfit. What do you think he's saying? My guess was "tough," but that doesn't really make sense. Then again, what logical thing would a guy in a bear outfit say? An eventual 91-yard drive by the Giants was almost cut short thanks to Randle dropping the ball in frustration without being touched by a Bears defender. The officials bailed Randle out, saying he had given himself up, but see for yourself. 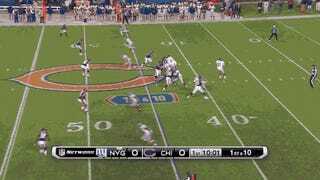 The Giants finished the drive with another Jacobs dive, cutting the Bears' lead to six. New York got the ball back, still down six, with roughly five minutes left. The Giants started a nice drive, but it ended abruptly after tight end Brandon Myers couldn't reel in Manning's pass, instead deflecting it into Jenning's arms for Eli's third interception of the night. Through six games, Manning has thrown 15 interceptions. The Giants are still winless.